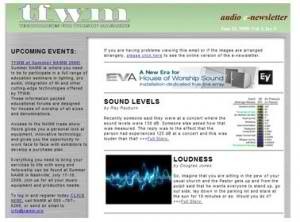 Each issue of TFWM’s Audio E-Newsletter features useful articles and links to essential resources for the volunteer sound technician. Learn the basics of microphones, loudspeakers, front of house consoles and more, from a practical perspective. TFWM’s Audio E-Newsletter is produced every two weeks.